CNN's Erin Burnett spoke in support of social workers. Screenshot courtesy of CNN. 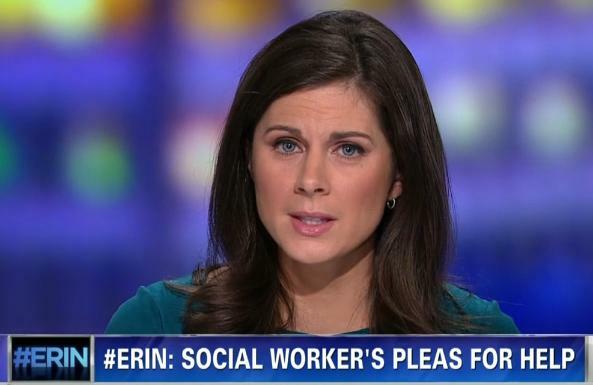 Today SocialWorkersSpeak.org would like to send a special cheer to CNN’s Erin Burnett, who spoke out in support of social workers after the tragic deaths of Braden and Charles Powell. “Social work is one of the jobs like police that we rarely hear about until something has gone horribly wrong,” Burnett said. Elizabeth Griffin Hall, who many news reports identify as a social worker, took the Braden and Charles on home visits to their father Josh, who was a suspect in the 2009 disappearance of their mother Susan Cox-Powell. Josh Powell on Feb. 5 rushed the children into his home in Puyallup, Wash., locked out Griffin Hall, and set off a fiery explosion that killed himself and the children. Griffin Hall had banged on the door to get in and then called emergency responders in a frantic effort to rescue the children. “The world lost two beautiful boys to a monster,” Griffin Hall said in the ABC News interview. To watch Erin Burnett’s full clip on CNN click here. I just wanted to thank you for your words. I am a social worker and it breaks my heart to hear what happened to those boys. I feel for the family and the worker involved. People have no idea what we go through and see on a daily basis and the gut wrenching decisions that have to be made. Usually when I hear people talk about social workers they don’t have many good things to say. It is refreshing to hear someone talking about social workers in a light that shows that we are doing our best. Thank you a million times over. I am a practicing Licensed Master Social Worker.